This month, Kristine of Connecticut is the random winner of our First Friday Freebie contest! Congratulations to Kristine! 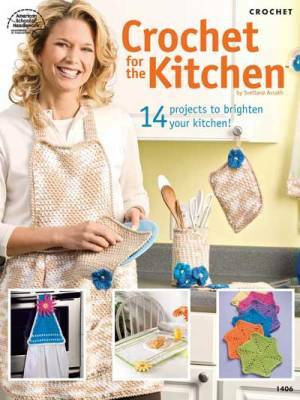 She will be receiving a copy of the booklet Crochet For The Kitchen, a collection of 14 crochet kitchen patterns. Thanks to everyone who participated! Stay tuned for our next contest on Friday, March 5, 2010. We have a really fun crochet book this month for our First Friday Freebie giveaway. You have a chance to win Crochet for the Kitchen published by the American School of Needlecraft in 2006 (24 pages of patterns) and designed by Svetlana Avrakh. Crochet patterns consist of 14 fun and easy projects including aprons, dishcloths, towel toppers, scrubbies, curtain trims and place mats. Designs use cotton worsted weight yarn. We think you will love some quick, easy and fun projects to work on. In order for you to win this month’s offering, just leave a comment here on this post telling us what was the last project you made using 100% cotton worsted weight yarn. cutecrochetATgmailDOTcom along with your name. We cannot notify a winner without an email address. Winner will be chosen at random on February 19, 2010. I am please to announce that Tracie of Florida is the random winner of our January First Friday Freebie contest! Congratulations to Tracie! She will be receiving a copy of the book Organizing from the Inside Out! We would love to hear if you are able to make any organizational changes, Tracie! Thanks to everyone who participated! Stay tuned for our next contest on Friday, February 5, 2010. HAPPY NEW YEAR to everyone! We hope you had a wonderful holiday! It is time for our First Friday Freebie contest again. I can hardly believe it is 2010. How did that happen? For this month, in honor of new beginnings, we are giving away a wonderfully helpful book by Julie Morgenstern, who has been dubbed the “queen of putting people’s lives in order” by USA Today. 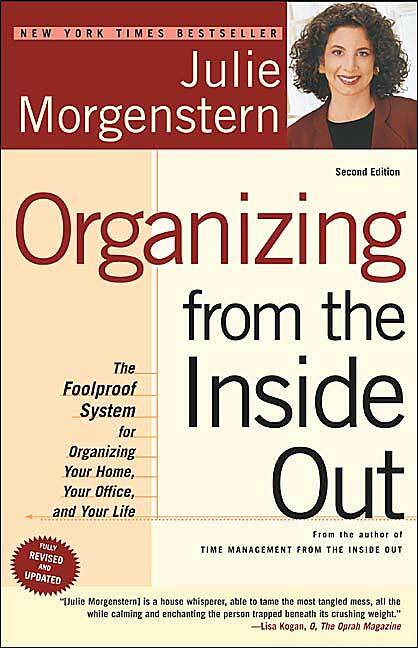 We are offering the New York Times bestseller, “Organizing from the Inside Out” as our First Friday Freebie this month. My resolution for the New Year is to become more organized, write more posts for this blog and to try and offer more new designs in 2010! If you would like to become more organized this year, in order for you to win this month’s offering, just leave a comment here on this post telling us if you made any New Year’s resolutions for 2010! The random drawing will be on January 22nd. Good luck! The winner of our November giveaway is Linda of South Carolina! Thanks to Linda and everyone for participating! Our next First Friday Freebie will be THIS FRIDAY!